Venus is transformed by Warhol into a Hollywood starlet. Warhol crops the well known Botticelli painting to focus on her face. Warhol’s version is colorful and modern. It accentuates the mythological goddess of love. Birth of Venus by Andy Warhol is A portfolio of four screenprints of Botticelli’s goddess of Venus on Arches Aquarelle paper by Andy Warhol. Warhol was known to obsess over the fame of celebrities of Hollywood. Therefore, he took a classical art piece of the past and redefined it in terms of divinity of the modern American idols. Warhol created four different versions of Sandro Botticelli’s Birth of Venus, as he did with the Marilyn, bestowing celebrity status on Venus, the Roman goddess of love. 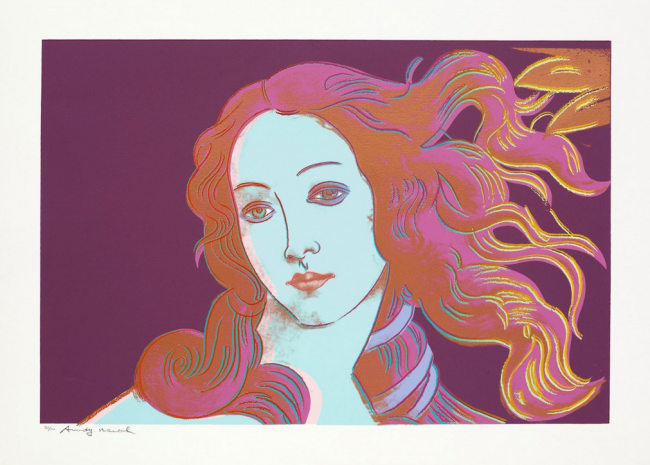 By using his signature techniques of producing prints in a variety of pop color combinations, he is able to produce a characteristically pop version of Venus. Venus, the Roman goddess of love, is transformed with vibrant colors, which bestows upon her a celebrity status like those of Hollywood. Although Botticelli’s original work of Venus has an elaborate background with her full body, Warhol choses to focus on her face and flowing hair to emphasize Venus. Warhol’s version of the Birth of Venus features Venus with fire red hair and a dark complexion, against a stark white so as to accentuate her divinity. From Andy Warhol Paintings to Andy Warhol Prints and unique pieces, the artist’s works are available for sale from Guy Hepner.